CHICAGO--(BUSINESS WIRE)--Apr. 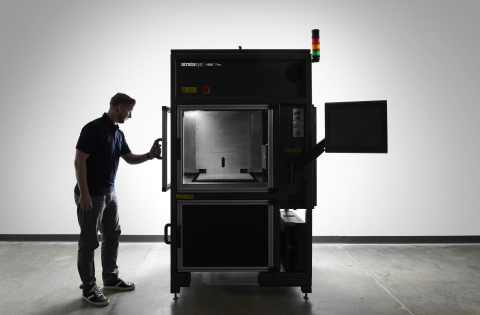 1, 2019-- AMUG 2019 – Set to disrupt traditional 3D printing, the new V650™ Flex stereolithography 3D printer from Stratasys (NASDAQ: SSYS) is the company’s entry into the stereolithography segment. This unique offering combines the power of a large-scale system with a configurable environment for fine-tuning across a broad range of resins – giving customers greater accuracy, choice, and lower costs in 3D printed prototype and part development. The statements in this press release relating to Stratasys’ beliefs regarding the benefits consumers will experience from the V650 Flex stereolithography 3D printer are forward-looking statements reflecting management's expectations and beliefs. These forward-looking statements are based on current information that is, by its nature, subject to rapid and even abrupt change. Due to risks and uncertainties associated with Stratasys' business, actual results could differ materially from those projected or implied by these forward-looking statements. These risks and uncertainties include, but are not limited to: the risk that consumers will not perceive the benefits of the V650 Flex stereolithography 3D printer to be the same as Stratasys does; and other risk factors set under the caption “Risk Factors” in Stratasys' most recent Annual Report on Form 20-F, filed with the Securities and Exchange Commission (SEC) on March 7, 2019. Stratasys is under no obligation (and expressly disclaims any obligation) to update or alter its forward-looking statements, whether as a result of new information, future events or otherwise, except as otherwise required by the rules and regulations of the SEC. Royal DSM is a global purpose-led, science-based company in Nutrition, Health and Sustainable Living. DSM’s purpose is to create brighter lives for all. DSM addresses with its products and solutions some of the world’s biggest challenges whilst creating simultaneously economic-, environmental- and societal value for all its stakeholders; customers, employees, shareholders, and society-at-large. DSM delivers innovative solutions for human nutrition, animal nutrition, personal care and aroma, medical devices, green products and applications, and new mobility and connectivity. DSM and its associated companies deliver annual net sales of about €10 billion with approximately 23,000 employees. The company was founded in 1902 and is listed on EuronextAmsterdam. More information can be found at www.dsm.com.